The main intention of this scan is to evaluate the Nervous System. Every cell of your body is controlled, either directly or indirectly, by the communication within this system as stated in Grey’s Anatomy (the medical book on page 4). This test is a measure of the Autonomic Nervous System, which can further be separated into the Sympathetic and Parasympathetic Nervous Systems. Heart Rate Variability is the beat-to-beat variation in heart rate. This natural rise and fall of heart rate is caused by several physiologic phenomena, including breathing and autonomic nervous system activity. Chiropractic doctors use HRV to get a window into how the autonomic nervous system (ANS) modulates heart rate and its balance. The more stress, wear-and-tear, out of balance your Autonomic Nervous system is, the less your body is able to adapt to stresses and heal. Published research has demonstrated that chiropractic adjustments have favorable effects on HRV parameters. The Insight Subluxation Station is certified by the Space Foundation and even used to evaluate astronauts. Surface Electromyography scans are looking on the “outside” to measure neuromuscular stress and tension, symmetry, etc…. measures the minute amounts of electrical energy in the muscles along your spine. Subluxations disturb the function of the nervous system. This can produce too much or too little electrical activity in your muscles. It’s here we can really also tell the “energy/stress” is on the system, whether it’s too much or too little, and whether it’s well organized. We use this highly-accurate, non-invasive scan to document your progress. It’s more accurate than how you feel. As you’d expect, this measures temperature. When there are disturbances to your nervous system along the spine, there are often temperature differences from side to side. This is due to inflammation and changes in blood flow. This scan is looking at how things are working “inside” with the organs, glands, tissues (via the autonomic nervous system), so we can really see if there is inflammation and irritation within the body like the ears, sinuses, lungs, stomach/gut, ect. Our thermal scan is non-invasive and reveals the condition of your autonomic nervous system controlling your organs, glands and circulatory system. At your report, you’ll get to see the computerized printout and learn what it means. 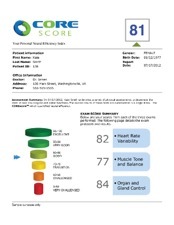 Our state-of-the-art software will take the results of your three scans and combine them into one simple score. Based on a scale from 0-100, the higher the number the less stress on your nervous system and your increased potential for health and wellness. Because your care is based on the condition of your nervous system, not how you feel, this technology is the focal point of our practice.